Warm white sand beaches, crystal clear water, romantic Caribbean nights, world class hotels, restaurants and nightlife – this is Cancun. This tropical paradise remains one of the world's top tourist destinations. Home to the world's second largest barrier reef, Cancun is an ideal place for scuba diving and snorkeling. The adventure enthusiast may also be interested in exploring a Cenote. You may also want to go golfing, fishing or play tennis. Fishing in Cancun is one of the most popular activities in the area because of the diverse ecosystem. The diverse ecosystem is home to a vast variety of fish that can be spotted in the surrounding fishing sites. A fishing escapade in Cancun with Yachts Cancun Luxury Charters guarantees quality, value for money, great service and most importantly an impressive catch as per the season. Thousands of people flock to Mexico each year to enjoy Cancun sports fishing wherein you can catch sailfish, marlin and huge dolphin fish. A private Cancun deep sea fishing charter is recommended if you would like to go after the big fish. This fishing adventure will be a memorable fiesta, and one you will never forget. If you're traveling alone or as a couple and would like to experience deep sea fishing, Cancun private fishing charters are perfect. 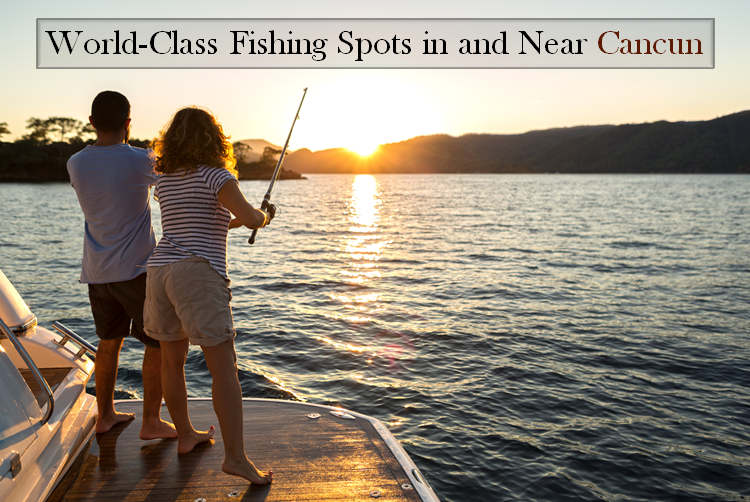 Some of the world-class fishing spots are located either in Cancun or in close proximity to Cancun. Here are a few choice destinations to experience. Nichupte Lagoon – Located just 15 minutes away, breathtaking Nichupte Lagoon is home to younger versions of the sports fish that swims in the deeper part of the ocean. You can also come across snook, barracuda, tarpon, and snapper. From shore to spot, you will see smaller fish that make this tour a family friendly activity for the anglers can also join the fun. The professional guide will bait the line and even set the hook if you prefer, and will later hand over the rod so that the little one can reel in the catch and feel ecstatic. Isla Blanca – This gorgeous island is located north of Cancun. It is another popular destination where the anglers can be part of shallow water fishing. The elusive permit here poses a challenge for even the most experienced anglers. However, the sand bottom flats and shallow water together makes the perfect backdrop for chasing after them. Click as many photos as you want against the panoramic surroundings. Isla Blanca is an hour’s drive from Cancun and can be reached by boat as well. Open Water – Hop on a fishing charter and set sail on the open ocean to look for marlins, shark, tuna, sailfish and other giants. Cancun is one such place in the Mexican Caribbean island that offers plenty of deep-sea fishing opportunities under the guidance of professional experts. The fishing tours are conducted daily, all days and season of the year. Most fishing tours can be scheduled for between 4 and 8 hours. If you want to lose sight of land and hook some of the biggest and most powerful fish on the planet, be ready to experience the wonder of deep-sea fishing in Cancun. Some of the most popular fish you can come across in Cancun include Sawfish, Bonito, Snapper, Grouper, Kingfish, Roosterfish, Bonefish, tarpon, snook, sea trout and permit. Deep sea species near Cancun are mahi mahi, sailfish, wahoo, barracuda catfish, tuna, blue and white marlin. Certain protected species (such as Blue Marlin) must be returned to the water immediately after being weighed and photographed. The guide ensures that these rules are followed strictly. If you happen to have any edible catch, you can keep it, and in many cases have it prepared on your vessel by your onboard chef. The fishing charters leave early in the morning, and many offer an option to return after a few hours, leaving your afternoon open for other Cancun adventures! World-renowned fishing, diving and snorkeling can be experienced in the turquoise blue waters of Cancun. We at Yachts Cancun Luxury Charters, offer custom private tour experiences for groups of 1-100 participants on seamless service, complimentary itinerary planning, and personalized attention to your fishing in Cancun escapade. While fishing under the guidance of professional experts, you will enjoy a fishing charter like no other. We’ll take great care of you.